* My daughter is an enthusiastic girl, prone to exclamations and grand pronouncements. Especially when it comes to food. Maggie loves to eat, and does so with the zeal of a rhinoceros. Last night I told her that Mom had a meeting after work, and then we had to run out for Open House Night at school, so I was ordering pizza for the boys. “What am I going to eat?” she asked. 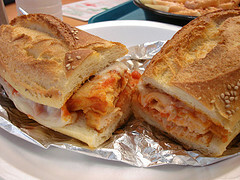 I said I’d order a chicken parm sub for her. 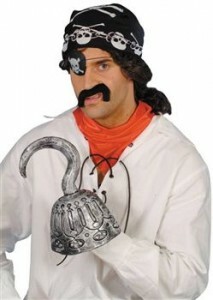 Regrettably, due to an excess of rum and ill-advised gusto, I cut off my right hand and inserted a hook. I hoped it would lend me street credibility, a quality that’s equally important to rappers and children’s book authors alike. But now I can only wear slip-on shoes. Arrrr. A while back I nominated Kiss the Book for best logo image — and my support has not wavered. It’s actually a very good site, and you can find it on my handy, dandy sidebar. 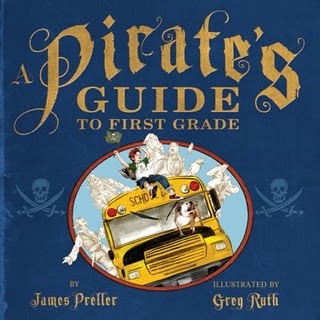 The good folks over there recently reviewed A Pirate’s Guide. “If you want your students to spend the next few hours speaking and acting like pirates – this is exactly the right book for you. What a fun way to start the school year – ending with a trip to the library to find the buried treasure!” — Kiss the Book. * Lastly, two reminders: If you are within range of Tarrytown, NY, this Sunday, September 19 (which is, coincidentally “Talk Like a Pirate Day”), you’ll find me and dozens of way better authors & illustrators at “Sunnyside.” Click here for more details.